A minimally invasive treatment can help restore fertility in women with uterine fibroids, according to a new study published online, June 13, in the journal Radiology. Our findings show that UFE is a fertility-restoring procedure in women with uterine fibroids who wish to conceive, and pregnancy following UFE appears to be safe with low morbidity. A minimally invasive treatment can help restore fertility in women with uterine fibroids, according to a new study published online in the journal Radiology. Uterine fibroids, abnormal masses of fiber and muscle tissue in the wall of the uterus, are considered one of the most common causes of infertility and complications related to pregnancy. Previous research has found that one out of every four women with fibroids has problems related to fertility. The standard treatment option for such women is myomectomy, or surgical removal of the fibroids. However, myomectomy is not always possible or effective and can result in major complications including hysterectomy, according to study co-author João Martins Pisco, M.D., Ph.D., from the Department of Interventional Radiology at Saint Louis Hospital in Lisbon, Portugal. Uterine fibroid embolization (UFE) is a less invasive option that involves injection of an embolic agent, typically made up of very small beads, into the uterine arteries to block the blood supply to the uterus and fibroids. As the fibroids die and begin to shrink, the uterus fully recovers. UFE can be performed in patients with a prior myomectomy or in vitro fertilization (IVF). Despite its less invasive nature, UFE has yet to be fully embraced in the medical community as a fertility-preserving treatment for women with symptomatic fibroids due to concerns that the procedure may cause inadequate blood flow to the endometrium, or lining of the uterus, and the ovaries. For the new study, Dr. Pisco and colleagues assessed pregnancy rates in 359 women with uterine fibroids who were unable to conceive and who underwent either conventional or partial UFE. In conventional UFE, all uterine artery branches are embolized. However, the partial procedure requires treatment of only the small vessels to the fibroids, leaving the corresponding larger vessels unaffected. Partial UFE may help reduce the risks of infertility associated with conventional UFE. After an average follow-up of almost six years, 149 of the 359 women, or 41.5 percent, had become pregnant one or more times, and 131 gave birth to a total of 150 babies. It was the first pregnancy for more than 85 percent of the women who gave birth. The procedures had a clinical success rate of approximately 79 percent for fibroid-related symptoms. Complication rates were 14.6 percent for partial UFE and 23.1 percent for conventional UFE. The procedure was repeated in 28 patients whose fibroids had not been fully treated, as shown by MRI, and 11 of those patients subsequently got pregnant. Dr. Pisco suggested that UFE may become the first-line treatment for women with fibroids who wish to conceive, particularly for those with numerous or very large fibroids. Such patients have a fibroid recurrence rate of more than 60 percent after myomectomy, making UFE an important option. The researchers are continuing the treatments and compiling data. Since the time of writing, there were 12 additional pregnancies. 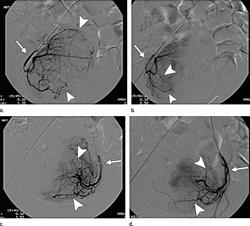 “Spontaneous Pregnancy with a Live Birth after Conventional and Partial Uterine Fibroid Embolization.” Collaborating with Dr. Pisco were Marisa Duarte, M.D., Tiago Bilhim, M.D., Ph.D., Jorge Branco, M.D., Ph.D., Fernando Cirurgião, M.D., Marcela Forjaz, M.D., Lúcia Fernandes, M.D., José Pereira, M.D., Nuno Costa, M.D., Joana B. M. Pisco, M.D., and António G. Oliveira, M.D., Ph.D.
For patient-friendly information on uterine fibroid embolization visit RadiologyInfo.org.